North Carolina resident Crystal Harris was listening to Garth Brooks' "Much Too Young (To Feel This Damn Old)" when an ad appeared on her iPhone screen, followed by a pop-up message. 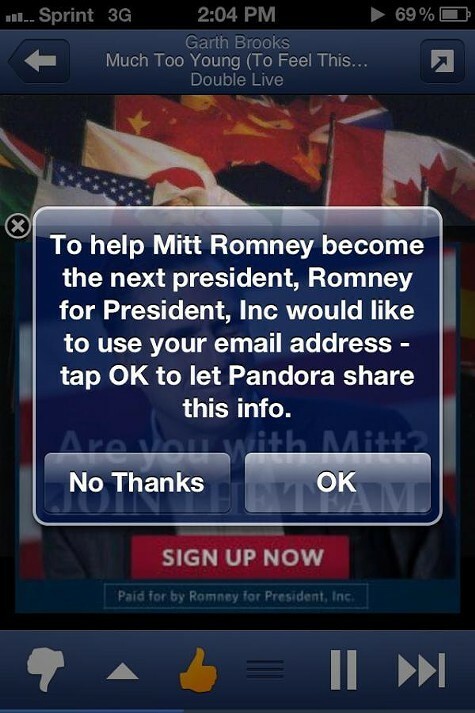 "To help Mitt Romney become the next president, Romney for President, Inc would like to use your email address — tap OK to let Pandora share this info," the message read. Harris took a screenshot of the request and tweeted it with a one-word comment: #fail. "Don't harass me on my email. Don't stalk me on the apps that I use. To me, that just crossed the line," Harris said in an interview with ProPublica. Pandora's targeted email sharing pitch isn't new, but it's being offered to political advertisers for the first time this year, a company spokeswoman said. Both Democrats and Republicans, and both local and national campaigns, have used the service to collect voter emails. It's among the latest in a series of increasingly sophisticated tactics that campaigns are using to target narrow groups of voters online — from sending ads to Internet users who have visited a candidate's website, to creating a mobile app for campaign volunteers that marks the names and addresses of nearby voters on a Google map. In the case of the Pandora ad, it's not clear why the Romney pop-up appeared on Harris' screen — whether she was targeted, because, for instance, she lives in a swing state, or because she was listening to Garth Brooks. Pandora, an Oakland-based company that would not comment on any client's particular strategy, offers both these kinds of targeting: campaigns can send ads to particular listeners based on their favorite artist or type of music, as well as by their age, gender and state, county, or congressional district. Pandora officials said the email sharing feature simply gives listeners what they want. "Sometimes, a listener wants to learn more about a product that's being advertised on Pandora, whether it's a car, a movie, or a political candidate," said Sean Duggan, Pandora's vice president of advertising, in an emailed statement. "On mobile, in particular, we offer many ways for a listener to do this: tapping on a banner ad, tap-to-email, tap-to-call or even opting-in to receive emails from the advertiser. "Pandora does not make public or share a user's registration information with third-parties without the user's explicit consent," Duggan continued. A Pandora spokeswoman added that the email sharing was "triple opt-in," since users have to click on the ad, then click OK, before Pandora shares their emails with a campaign or other advertiser. Users who get emails from a campaign or advertiser always have the option to unsubscribe, the spokeswoman said. The Romney campaign did not return a request for comment on the ad. There is evidence that the Romney campaign pays attention to the musical taste of potential supporters. Earlier this year, campaign officials told The New York Times that their online targeting research had revealed that people who like jazz were less likely to respond to their online ads. Harris, who said she's a registered Democrat, was listening to Pandora on an afternoon run when she received several Romney ads in a row — as well as a Pandora ad for the Obama campaign. Pandora said it was extremely rare for users to receive the same ad multiple times in a short period. Harris said she loves Pandora but that political ads may convince her to upgrade to an ad-free version of the service. Interested to learn more about how political groups are using your personal information? See ProPublica's reporting on Obama's mobile app, tailored campaign emails and the new wave of targeted online ads.